Rick Ross enlists Future, Nas, Young Thug, Meek Mill, Wale and more for his upcoming album "Rather You Than Me." 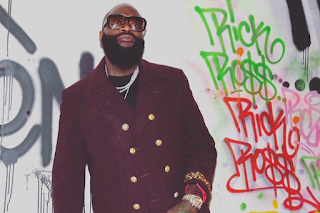 Just 24 hours after revealing the artwork and; features to his upcoming Rather You Than Me album, Rick Ross decides to let us know who’ll be on what by sharing its official tracklist. Laced with 14 tracks in total, the follow up to 2015’s Black Market will feature guest appearances from Young Thug, Future, Nas, Meek Mill, Wale, Yo Gotta, Chris Rock, Gucci Mane, Ty Dolls $ign, Jeezy, Den Loaf, and more. It’s currently being led by the single “I Think She Like” with Ty Dolla Sign, along with yesterday's new release "Trap Trap Trap" with Wale & Young Thug. Peep the official tracklist (below) and look for pre-order to go live at midnight tonight. Which record/collab are you most excited about hearing?